There is nothing worse than starting off a new Iron Condor, only to see the market move up or down 2-3% in a week. One method of protecting against short-term adverse moves is to use directional weekly butterflies, placed 2-3% away from the current price. It’s not a perfect hedge and it doesn’t always work out, but sometimes it can do just the trick. At the time, I was concerned that RUT might make a 2-3% move early in that trade, which would immediately put it under pressure. 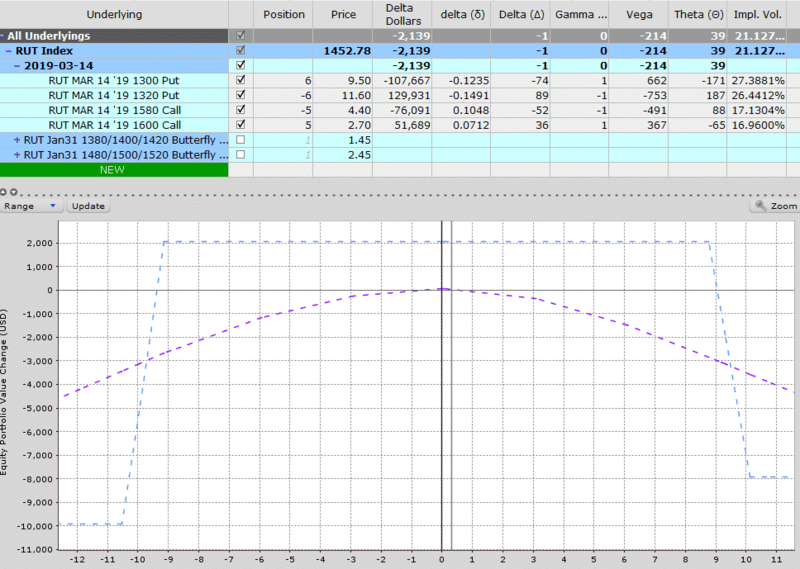 To help mitigate this risk, I added a weekly call butterfly above the market and a weekly put butterfly below the market. Total cost of the protection was $390. Within a week, RUT had rallied 2.4% from 1452 to 1487 which put it within the profit zone of my short-term butterfly hedge. The call butterfly had increased in value to $700 and the put butterfly was worthless, but between the two I had added $310 in profit to the Condor. 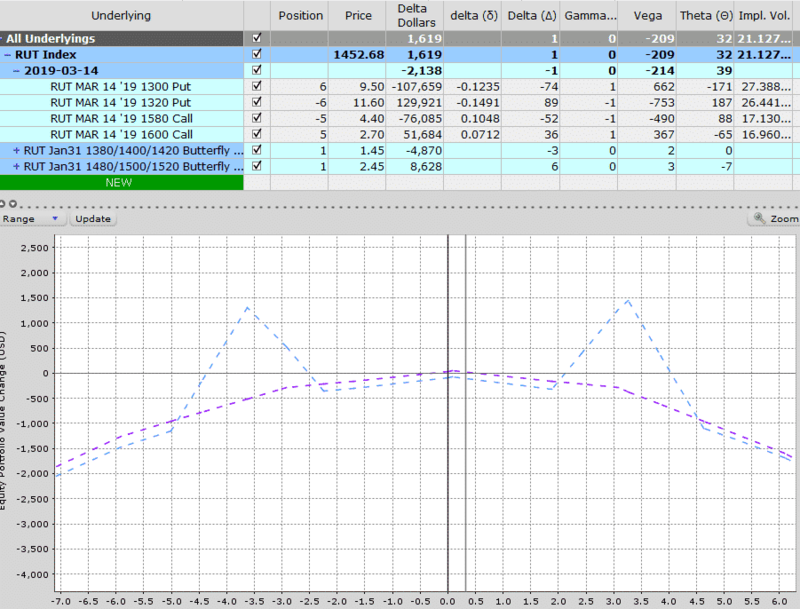 The Condor was also doing well and was +$350, so the overall position was +$660. With the market looking bullish I ended up rolling the call butterfly out for another week and centred it at 1530 for a cost of $270. Another week later and RUT had rallied to 1514 and was once again just inside the butterfly profit zone. With the butterfly rising from $270 to $730, this helped push the profit on the entire position to $1320 and it was time to close it out. When trading iron condors, the use of weekly directional butterflies is one of my favorite ways to protect against early price swings in the underlying.